Flood fill is a search that starts at a point and finds the areas connected to the start point. For example, the "bucket fill" in Photoshop or MS Paint uses flood fill to fill in the connecting areas of the same colour. Flood fill can be implemented using a BFS or DFS. 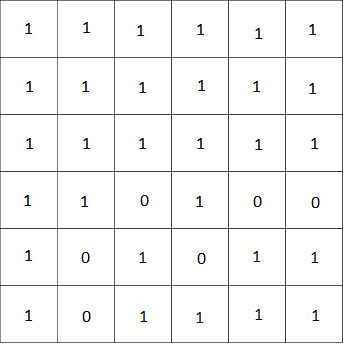 The above grid shows how flood fill works. 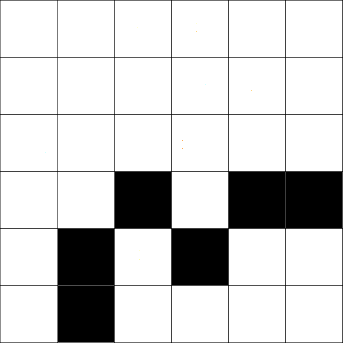 The number in each cell represents the number of steps from the starting cell and the black cells are blocked off. We start at the cell marked as 0 and we reach all adjacent cells. Given an N x M matrix and a start point and two colors (src and dst), we want to replace all the cells in the matrix that are connected to the start point with the color src and change to color dst as well as output the number of cells changed. 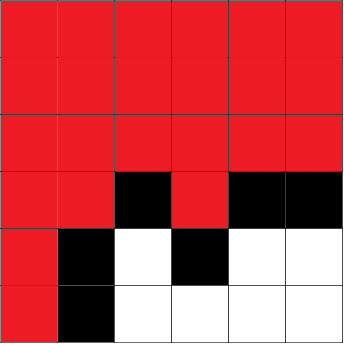 We use bucket fill in the top left corner of the bitmap to fill everything with the same color as the cell. This is the DFS approach to the problem. This is the BFS approach to the problem. 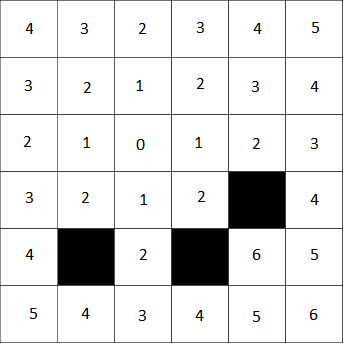 Given a NxN grid and a list of starting cells and wall cells, find the distance to the closest start point for every non-wall grid space without passing through a wall. 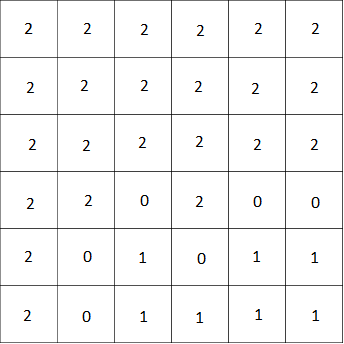 Given a grid of numbers where 0 means empty space and 1 means a wall, find the number of rooms and the perimeter of each room. The border of the grid is guaranteed to be walls. The number of rooms is 2, the perimeter of the first room is 12 and the perimeter of the second room is 4.